Difference between iCloud & iCloud Drive? How to View iCloud Data? Many Apple device users are confused about iCloud, the type of data that can be backed up on iCloud and the difference between iCloud and iCloud Drive. The service has been very important for users who want to ensure the safety of their data and for those who want a clear picture of exactly what they are getting, this article will describe the difference between iCloud and iCloud drive. To do that, we need to take a look at both these services individually. Let's do that. Part 1. What is iCloud? iCloud is basically Apple's storage service. It is not a sharing platform like Dropbox but it is very useful for storing some of the data on your device. When turned on, iCloud will back up the data on your device including documents, photos, contacts, calendars and the like. It will also backup all your iTunes store purchases although any music, videos or TV shows that you didn't purchase on iTunes will not be included in the backup. Part 2. What is iCloud Drive? 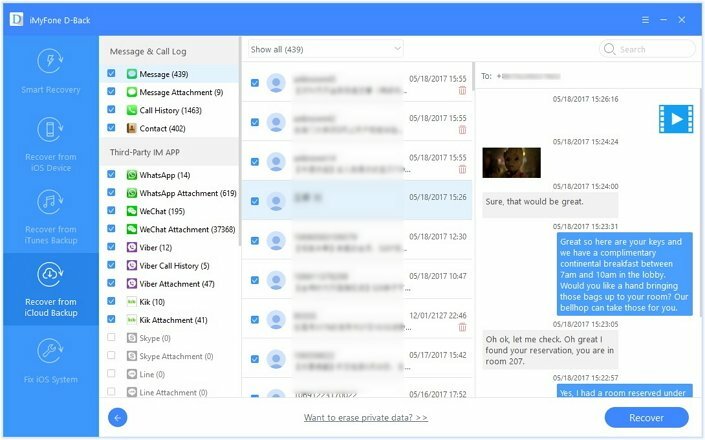 It is slightly different in operation as compared to Dropbox or Google Drive. Instead of accessing your collection of the files via the iCloud Drive app, you do so through the different corresponding apps. For example, you access photos in the iCloud drive via the photos app. Part 3. What's the Difference between iCloud & iCloud Drive? iCloud Drive is part of iCloud. What you saved on iCloud Drive will be saved in iCloud. iCloud mostly serves to back up your device and sync limited kinds of data to other Apple devices, while iCloud Drive more focuses on sharing among devices and seamless interaction and co-working among devices, which means that data in one device can be shared among other devices without copying, sending or transferring. For example, you create a new Pages file on your MacBook Air, put a few lines on it, and then throw it into iCloud Drive. Then you may continue working on it wherever you go as long as you have access to it via your iPhone or iPad. Part 4. How to View What's Backed up in iCloud? 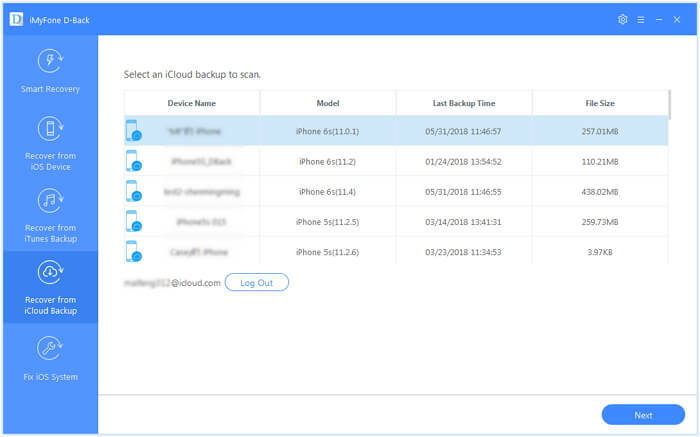 Sometimes iCloud may fail to backup all of your data so if you want to view the data that has been included in your latest iCloud backup, you may need the services of a third-party tool. 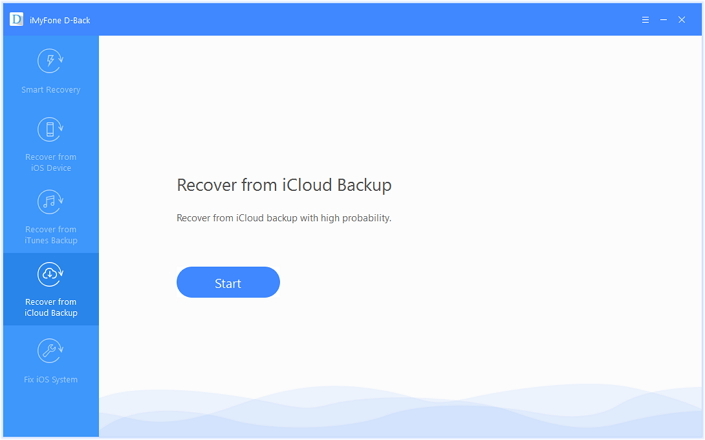 This third-party tool, iMyFone D-Back iCloud backup viewer for Win or iCloud backup viewer for Mac allows users to gain access to the backup and see what's inside. It is also a very powerful data recovery tool and the following are some of its features. You can recover and extract data directly from the iOS device, an iCloud or iTunes backup file. 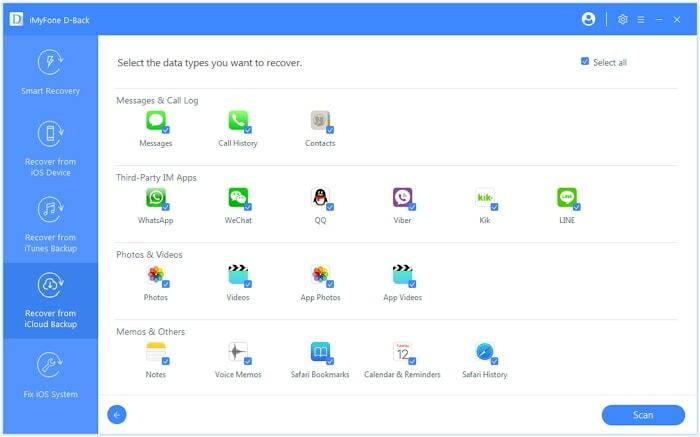 It is highly useful in iPhone data recovery, allowing users to recover up to 22 different types of data including photos, videos, messages, notes, voice memos, contacts, call logs and many more. Almost all iOS devices are supported such as iPhone X/8/7/6s (Plus)/6 (Plus)/5s/5c/5/4s/4 running iOS 7/8/9/10/11/12, even the newest iOS 11/12. It comes with a preview function that allows users to selectively recover data. Here's how to use iMyFone D-Back to View the data backed up in iCloud. Begin by downloading and installing the program on your computer and then follow these very simple steps. Step 1: run iMyFone D-Back on your computer and then select "Recover from iCloud Backup" from the main window. Click "Start" to begin. Step 2: In the next window, sign in to your iCloud account and then select the iCloud backup whose contents you want to view. Click "Next" and the program will download and san the iCloud backup. Step 3: You can select the type of data you want to view. If you want to view all the data in the backup, check "Select All" and then click "Scan" to continue. Step 4: All the data on that iCloud backup will be displayed on the next page. Select the data you want to view and you should be able to see the files. You can also select some of the data and click "Recover" to save it to your computer. Download the free trial version of iMyFone D-Back iCloud backup viewer for Win or iCloud backup viewer for Mac to view the iCloud backup files on your computer.